I am currently in the process of giving Moon in the Gutter a much needed upgrade. This will include changing the look of the blog, updating the links sections and ironing out a few other kinks. This will be a work in progress but I hope to get the majority done this week and then get some new posts rolling out. Thanks for your patience and continued support! I wanted to take a moment and share some information about some upcoming releases I am very excited about. First up, my friend and past Moon in the Gutter Q&A participant Jill Nelson is working on an exciting new book entitled 1976: Tapes From California and she has just started a new blog dedicated to it. Jill is one of my favorite writers and is a terrific person so please give a visit to her new blog and support her upcoming book. Next up we have the much anticipated re-release of David Hess' incredible soundtrack to Wes Craven's Last House on the Left. I have just pre-ordered the limited to 1000 CD and can't wait to hear it. Here is the link for American readers and a different one for International followers. Back to the bookshelf, legendary actress Seka is getting ready to release her sure to be essential autobiography Inside Seka. I am expecting my copy from Amazon next week and look forward to covering the book here after I read it. Here is the Amazon link for those interested, as well as a recent New York Daily News article on it. On the DVD and Blu-ray front. Severin Films has some amazing new releases coming up including a special edition of one of my favorites House on Straw Hill and a limited edition package dedicated to Jess Franco's The Hot Nights of Linda. Kino Redemption continue their incredibly valuable Mario Bava collection with two key films just released on DVD and Blu-ray, A Bay of Blood and Five Dolls for an August Moon. Both discs look incredible and contain essential Tim Lucas commentary tracks. Two of my favorite bands, Goldfrapp and Mazzy Star, return this month. Both releases are a major cause for celebration. Finally the great Kathleen Hanna has recently resurrected her band Julie Ruin and the new EP is a real jaw dropper. Visit their site here and give a listen. After about a year of being totally burned out and exhausted I have started to feel like I am back in business as the summer is drawing to a close. I have several writing projects I have been working on (more details soon) and I am feeling reenergized, reorganized and revitalized personally, professionally and spiritually. To capitalize on this I recently started a new project and am restarted an older one. First up we have the long gestating Jean Rollin Forum, a message board I recently created to go along with my Rollin blog Fascination. Two weeks in and we already have over a dozen members and a number of great conversations going. If you are interested in Rollin please visit the board and send me a membership request to access all of the forums. Also, I have just relaunched Harry Moseby Confidential, my tribute to the figures, films, sights and sounds of the seventies! Consider this Moseby 2.0 as I am expanding it to include not just the seventies but the fifteen year period between 1968 and 1983, probably my favorite stretch of time in popular culture. So, pay me a visit to both places and Let's Rock Again! It's one of the most brilliant and shocking openings in horror film history. As we are greeted with the first flickering of celluloid we see a seemingly abandoned alley only visibly lit by a lantern in the foreground. The black and white photography is immediately jolting and that, combined with the deadening silence on the soundtrack, makes us think we are perhaps watching an expressionistic film from the silent era. 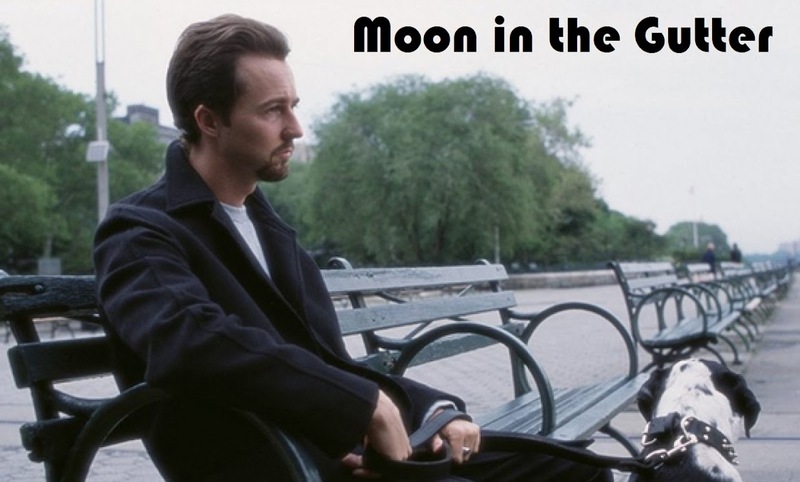 As the camera begins to pan down to the street we suddenly hear a the sound of a woman singing and the first strains of the film's audacious and dissonant jazz score. A lady of the night comes into frame as the camera pans down even more. She is holding a purse in one hand and a wine bottle in the other and she is clearly intoxicated. She sings, and even twirls, as she stumbles down the street to a door as the camera lingers and the music on the soundtrack gets progressively more percussive, more intense. 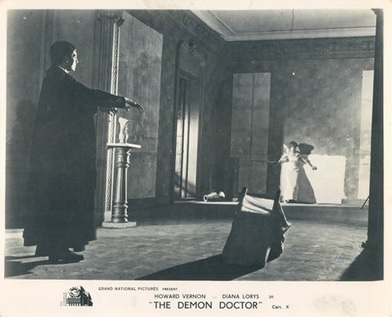 The credits begin to roll as she opens her door...L'Horrible Docteur Orlof or The Awful Dr. Orlof depending on which version you are watching. What an utterly bizarre title that is and yet even before we are even a minute into the film it seems to capture the sheer oddness of everything that is beginning to play out in front of our eyes. The woman makes her way into her flat but our eyes are left on the alley, once again seemingly abandoned, as the credits continue to roll. After a moment the camera begins to slowly pan up the side of the building and we notice the first edit in the film and it is almost a subliminal one. A light appears in the window and BOOM edit number 2 but this one is jolting...even harsh. We are suddenly in the woman's apartment and the dark oppressive lighting outside has been transformed into something brighter but somehow even more menacing. The woman continues to sing and stumbles around her room as the camera quickly pulls back, its stillness replaced by a sudden frenzy. She takes yet another drink and is then momentarily entranced by her own reflection in a mirror. The music takes on a brief eerie stillness as our unnamed heroine shuffles to her closet where, upon opening, she is greeted by a truly horrifying sight as the soundtrack swells into a deafening shriek. Another jolting cut, a zoom-in on a man in the closet, his eyes bulging and lifeless. Is he wearing a mask or is he horribly disfigured? We only get a glance before another cut, this time a close-up of our female victim before another edit takes us back into the room where we witness a brutal attack. A fight ensues, the man pushes the woman towards her window and then we are suddenly back to our spot on the street looking up. The edits then take on a frenzied rapid fire approach cross-cutting rapidly between the fight, a shocked boy staring out of his apartment window and a man awakened by the sounds of his neighbor screaming. We see the lamp in her apartment knocked over in the scuffle as the as of yet unnamed assailant renders her unconscious and carries her possibly lifeless body out of her apartment back to our abandoned alleyway. Our attacker wanders aimlessly down the alley way until the sound of cane tapping against a nearby wall alerts him to follow. We see a stranger in the distance waiting and then leading this mysterious monster, and our doomed lady, down another isolated alley way into the deep dark black of the night. While Gritos en la noche, or The Awful Dr. Orlof as it is more universally recognized, wasn't the first film that Jesus Franco Manera had directed it was the work that would forcefully announce him as one of the most daring and distinctive filmmakers of the sound era. Viewed now more than fifty years after its original 1962 release date The Awful Dr. Orlof stills feels as perverse and shocking as ever. While it is much more controlled and subtle, mostly due to the rigid censorship that was in place in the early sixties, than Franco's most personal later works it remains one of the most progressive horror films ever made. As Cathal Tohill and Pete Tombs would write in their indispensable Immoral Tales, "there was nothing old hat about this dank masterpiece, it pulsed with a new freshness, ransacking the annals of cinema with a deviant vigor." I must admit that I have never felt the remaining portion of The Awful Dr. Orlof ever quite matches the absolute genius that is on display during its opening few minutes. Aspects of the film have a certain procedural quality that I don't completely respond to but there is no question that it is one of the most important films in Jess Franco's unbelievably prolific career and one of the most important films of the sixties. While actors Howard Vernon, Diana Lorys and Richard Valle (so unforgettable as the monstrous Morpho) all give star-making turns my favorite aspects of the production remain Franco's daring direction (which transcends the film's incredibly low-budget and chaotic shooting schedule in every shot), the incredible black and white photography of Godofredo Pacheco (which manages to tip its hat to decades old classics while being totally transgressive) and the ferocious cutting of editor Alfonso Santacana (who would put many of the skills he had learned working with Franco to iconic use a couple of years down the road for Sergio Leone's A Fistful of Dollars). Despite its budget, and forgiving some continuity errors that were caused by the varying versions of the film prepared, The Awful Dr. Orlof is an incredibly well-made and effective film. It remains perhaps the easiest, and most natural, entry-way into the world of Jess Franco even though ultimately I think he would perfect many of the films themes and stylistic touches in later works. 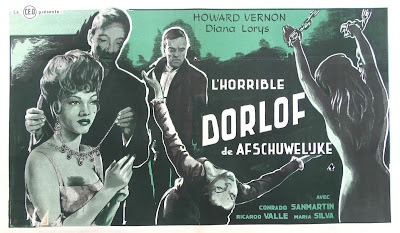 The Awful Dr. Orlof has recently been released as a splendid special edition DVD and Blu-ray by Redemption/Kino Lorber. 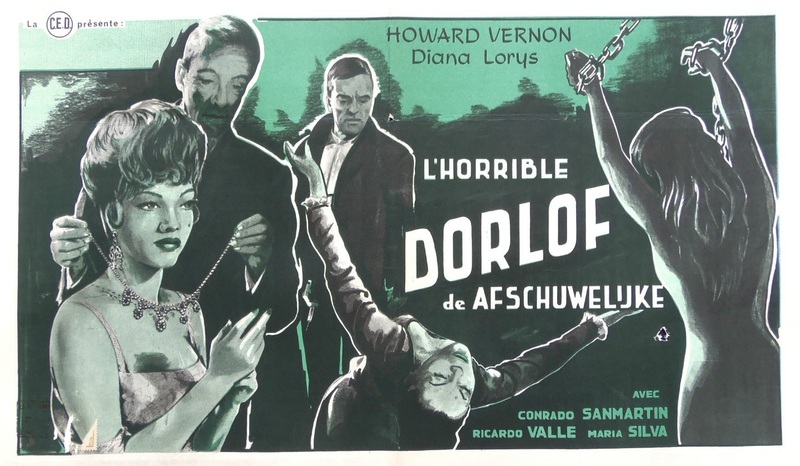 Containing the more explicit French-language cut (with the English dub offered as a separate audio-track) this newly struck print of The Awful Dr. Orlof looks quite good. Some print damage is apparent throughout the film but I have never seen a version of this work that is visually as detailed and intoxicating. Like their other most recent Franco releases (A Virgin Among the Living Dead and Nightmares Come at Night) The Awful Dr. Orlof comes armed with some really splendid extras including a David Gregory directed and Elijah Drenner produced interview with the much-missed Franco and a terrific new near 20 minute documentary on the film from director Daniel Gouyette. 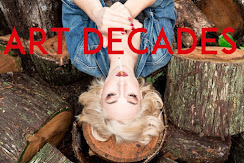 A trailer for the film, and other Franco titles, is also on hand as well as a photo gallery and the very moving Gouyette work Homage to Jess that also graces the other new Franco releases. Last but certainly not least we have a wonderful new Tim Lucas audio-commentary, that is a wonderfully detailed and an essential listen for fans of the film, Franco and horror-cinema in general. If I have one complaint about this new special edition release of The Awful Dr. Orlof it is that it doesn't contain the longer alternate Spanish version that is mentioned numerous times on the film's supplements. Otherwise this is a stellar new release and a major upgrade for an undeniably important film.